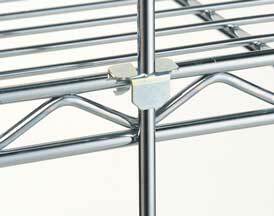 • Ease of Assembly: Grooves on shelves position and lock shelves to the uprights. Unit is assembled in minutes. No nuts, bolts or special tools are required. 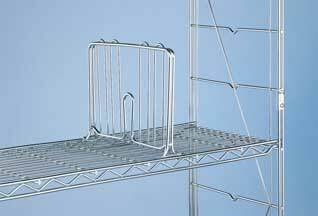 • Unique Design: The open wire construction of Erecta Shelf® minimizes dust accumulation and allows a free circulation of air, greater visibility of stored items and greater light penetration. • Versatile Construction: Erecta Shelf® shelving changes as quickly as your needs change. By using various accessories, hundreds of shelving configurations become possible. 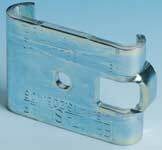 • Uprights: Consist of two vertical 1/4" (6mm) diameter outer wires on each side with #4 diameter support wires welded between each of the outer pair spaced at 5" (127mm) intervals. Diagonal wire provides additional support. • Adjustability: Shelves can be placed at 5"(127mm) intervals along the upright. 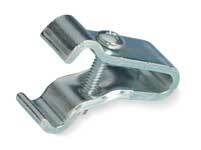 • Adjustable Feet: Bolt levelers compensate for surface irregularities. • Shipped Knocked Down to save freight costs. Prevents items from protruding or falling from shelves with these easy-to-install ledges. Form side and back enclosures for a shelving unit. 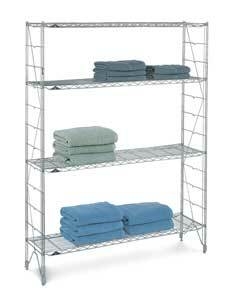 Can also serve as uniform dividers within unit by passing through shelves from top to bottom. Recommended spacing: every 6" (150mm) to 12" (305mm), depending upon shelf contents. Keeps shelves orderly with these snap-in-place, 8" (203mm) high dividers. When units are joined end-to-end, clamps hold adjacent uprights securely together for a higher degree of stability.